HMRC has posted its international automatic exchange guidance on the government website, following another meeting held with STEP and charity advisors: International Exchange of Information Manual. The charity guidance will be posted within a week, the HMRC working group promises. Attendees at the meeting discussed the mechanics of the due diligence process of charities in more detail; in particular, self-certification and tax residency. All beneficiaries and the gifts that they have received must be reported by a charity that is a Financial Institution (FI). Their name, payment and residency must also be reported, and there will be a tick box for UK residency. In some scenarios, where charities are donating to the homeless and/or destitute, HMRC confirms that it will be difficult to obtain a self-certification of the beneficiary. In these circumstances, if the gift is being made in a reportable jurisdiction, the self-certification can be verified on a verbal basis. It can also be assumed that an apparently homeless person is tax resident in the country that they are present in at the time of the gift. No supporting documentation is required by HMRC if the question of residency appears acceptable, and adheres to a common sense ‘reasonableness’ test. Generally, no follow up of the beneficiary is necessary on this basis. It is only necessary to acquire the beneficiary’s Taxpayer Identification Number (TIN) when they are resident in a country that provides them (Reportable Information: Tax Identification Number), and when it is reasonable to be able to acquire it. The tick box on the form for the TIN will be optional. Gifts under approximately £100 (to be confirmed) are not reportable in non-reportable jurisdictions. Food and supplies that are donated are not reportable, and vouchers, whether cash or otherwise, are currently being considered. HMRC confirmed that there will be a £300 fine for not submitting a report on time and a higher fine for delayed failure for a reporting entity. However, the £300 figure is currently under review and may be increased. There will be a £3,000 fine for an inaccurate report as a result of ‘deliberate behaviour’. STEP’s meetings with HMRC are conducted on a monthly basis, however HMRC is to run more events with financial entities that will be affected by CRS (the OECD Common Reporting Standard) in order to provide further training. In the meantime, we welcome any specific queries or input from practitioners which we will pass on to the working group for clarification. Please contact us at policy@step.org. The Financial Action Task Force (FATF) Private Sector Consultative Forum in Vienna earlier this week explored measures to combat terrorist financing, writes STEP’s Sean Smith. The first day focused on the risk of terrorist abuse in Non-Profit Organisations – a sector deemed vulnerable because of the resources they use and their geographical spread. On the second day, the forum considered existing barriers to information sharing and how these could be eased to enable both the private and public sectors to more effectively communicate data, whilst respecting privacy laws. The final session looked at correspondent banking and how such correspondent banking relationships are established and monitored. The underlying themes across all of these discussions were reputation, standardisation and communication. In particular, how to build and maintain confidence in the financial and charitable sectors and agreeing definitions of key terms and principles, such as what constitutes a reasonable request for information (RFI), so that the private sector, governments and civil society can work together more effectively. A delegate opened one of the sessions with the comment that these issues had been discussed many times over the years to the point where each meeting felt like Groundhog Day. That is hardly surprising as trying to balance the needs of charities and their beneficiaries, the financial sector, governments and citizens’ rights to privacy is anything but straightforward. Thankfully, this meeting felt productive, with useful suggestions being raised, which sadly I can’t divulge just yet. It will be interesting to see what comes out of the FATF plenary, scheduled for 19-24 June in Busan, Republic of Korea. 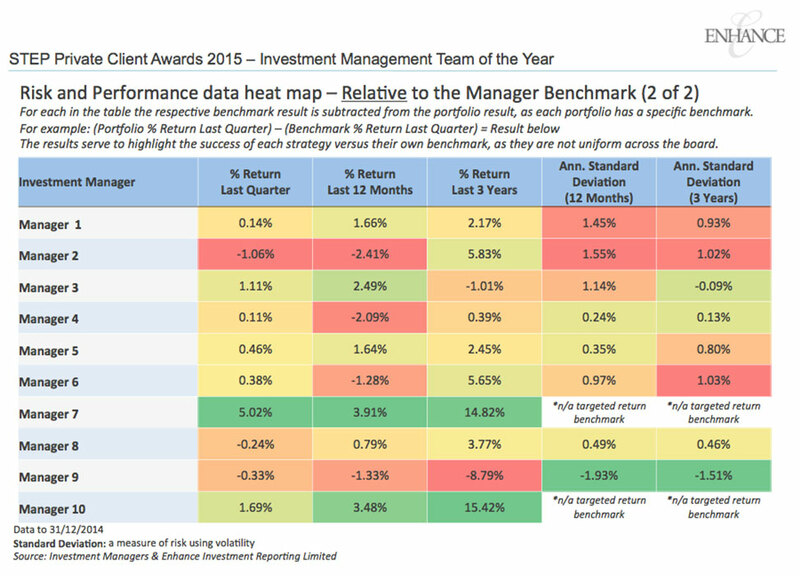 Enhance has been involved with STEP’s annual Private Client Awards for six years now, providing the judges with data analysis to give a clear picture of what firms submitting applications for ‘Investment Team of the Year’ have achieved over the last 12 months. Using proprietary fintech software, the analysis reviews investment performance and risk over various time periods to confirm that investors have received good results. Asset and currency allocation for each of the last 4 quarter-ends for a representative portfolio which aligns to the relevant strategy. To complete the performance and risk part of the application, you will also need to explain any successful asset allocation changes or recommendations made for clients over the last year and the effect this has had on performance. We then use your data (with strict confidentiality!) to provide the judges with clear analysis. Importantly, our software not only crunches the numbers, it presents the results in a meaningful way. We pull out visuals as part of a detailed report using ‘heat maps’, allowing for easy comparison and ensuring managers’ performances are presented on a common platform so the judges are truly comparing like-for-like. The data we provide enables the STEP judges to interpret performance and risk more clearly, and ensures their decision-making process is robust – but it’s important to highlight that our data presentation works in synergy with the judges’ expertise, not as a replacement. I can’t quite believe that my three-year term as Chair of STEP’s UK Practice Committee has reached its end! I was extremely honoured to have held the position, which opened my eyes to the great lengths that STEP members will voluntarily go through to assist fellow TEPs and share their breadth of knowledge. Guidance notes, blogs, articles, leaflets, webinars, lobbying, consultation responses, surveys and meetings with officials are just a few of the things that we as a committee get involved with. If you were a fly on the wall at our last committee meeting you would have seen that the new Law Commissioner for property, family and trust law attended to introduce himself and tell us about his new role. We welcomed back representatives of the Law Commission who updated us on the wills project and discussions were had regarding the project’s focus as well as the future Law Reform programmes. Furthermore, members of the committee will shortly be drafting a range of articles covering a plethora of topics; ranging from the pitfalls of acting as trustee, monies passing by nomination without safeguards, issues surrounding family bank accounts and business practice generally. I would like to personally thank the volunteers who sit on the committee and work tirelessly for the members to add value for the TEP. The committee is a made up of a mix of individuals from across the UK with differing specialisms and interests. We are fortunate to have luminaries of the speaker circuit, authors and editors of our favourite ‘go-to’ guidance books and the (just as important) practitioners on the ground who know the issues facing us day to day as a reality. Each member brings something unique and invaluable to the table. See who is involved at www.step.org/uk-practice-committee. We are of course always looking for fresh ideas, so if there is anything that you would like for us to be involved with or indeed if you would like to contribute to the cause yourself then please do get in touch via our dedicated email address: ukpractice@step.org. I am a great believer in keeping things fresh and promoting new ideas. In order to achieve this there naturally needs to be a change of order and I am thrilled to be passing on the baton to Kelly Greig for the next term and look forward to seeing what these changes bring as a continuing member of the committee. Cheryl Farnham TEP is a Director of Arcadia Legal & Trust Ltd and sits on the UK Practice Committee, England and Wales Regional Committee and West of England Branch Committee.